A couple of weeks back I was pleasantly surprised to have a comment left by Dave of Rings & Things telling me that I was one of the winners in their Blog Partner program for September. Yippee! That meant goodies from their current catalogue release were on their way to me. And just a week or so later here's what arrived on my doorstep all the way from the US: some really pretty gemstone donuts. 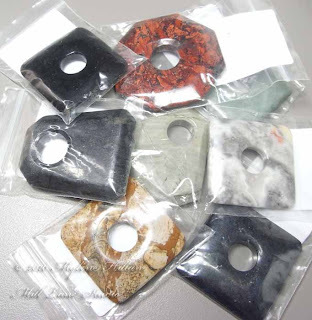 Before showing you what I did with them, I've got to say that I was quite apprehensive when I saw that the package contained gemstone donuts. If you scroll through the jewellery on my blog and website you'll see a complete absence of gemstones and there's a good reason for that: as much as I am fascinated by the earth's ability to produce these wonderful stones, I am completely intimidated by them and have to admit that I know very little about them. Not only that, but I have absolutely nothing in my stash that would work with them. Once I started playing with them, I discovered that I do have things in my stash that work with them. I remembered I had some donut bails that I bought a couple of years ago that were a good fit with this Black Stone square donut. 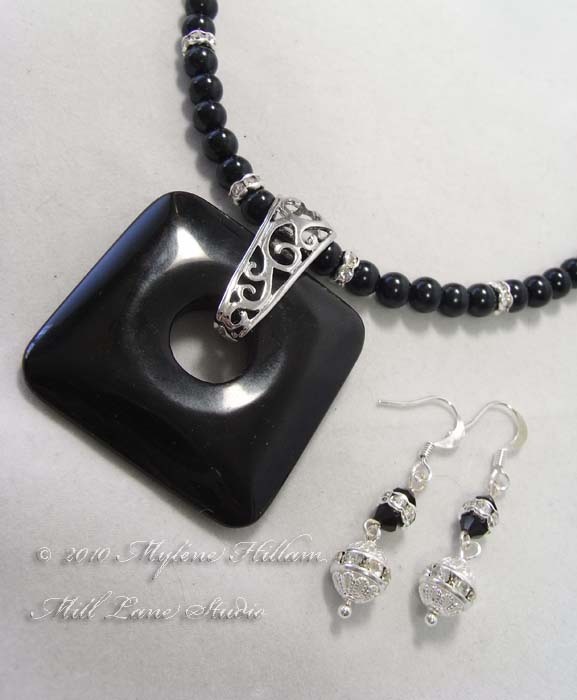 It's a simple design teaming black glass pearls and crystal rondelles with chain (not pictured). The glass pearls worked really well with the smooth, slick surface of the Black Stone. I made earrings to coordinate and they became the jewellery I wore for Melbourne Cup today. (They were the perfect accessory to the fascinator in my last post.) 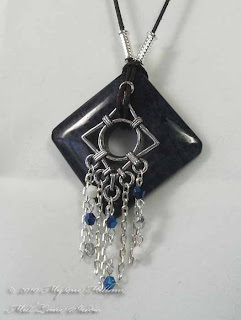 Next I used the Dumortierite stone. This stone is midnight blue and quite beautiful on its own but I added a chandelier earring component which had the same diameter hole as the donut and then dangled crystals and chain from the loops. I love how well this component sits against the donut now that it's strung on the leather cord. There is no adhesive holding it in place - it just sits there! And the final piece I worked with is Picture Jasper. 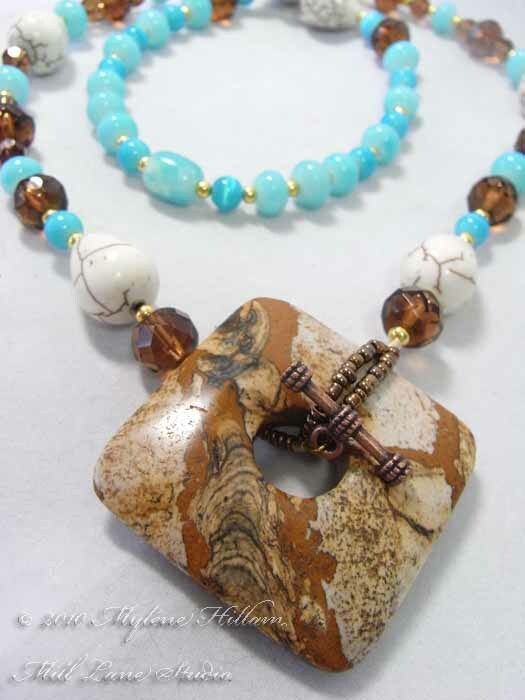 Now this is one very busy stone, but teaming it with cola and turquoise coloured glass beads has balanced the piece really well. I've created a beaded bail to secure the donut and then used the donut as the clasp to hook a toggle bar through. I love how this turned out! My thanks go to Rings & Things for providing the donuts for me to play with. It was a challenge, but I loved having to move out of my comfort zone and I now have a new appreciation for these beauties that were formed by the fiery core of our planet. And now, I'd like to give you the opportunity to have a play with a gemstone donut too! I have two to give away so there will be two winners this week: a Silver Mist Jasper Trillion and a Dumortierite Faceted Trapezoid. For your chance to win, just leave a comment on this post. This is open to readers all around the world and will be running for a week. I'll draw a random winner on Tuesday 9th November. Don't forget to check back to see if you've won. Absolutely fabulous Mylene, lovely work! Karla Mac Donald said Well done, Mylene ... can't wait to see what you create with from your goodies. Ooh, I love them all, but my favourite would have to be the picture jasper. Your creations always inspire, thanks for the opportunity to win one of them. It was great catching up with you on Saturday Mylene, would love to win this giveaway as well. Wow Mylene these are amazing, your creativity shows no boundaries. Thank you for sharing your work with us. Gorgeous pieces Mylene - your jewellery is stunning no matter what mediums you use! I love the jewellery Mylene, thanks for the chance to be in the draw. Although brief, it was great to catch up with you in Sydney last weekend. Great to catch with you once more. Your ideas are insspirational & you make it look so easy! Looking forward to seeing what you create from the FP last weekend.